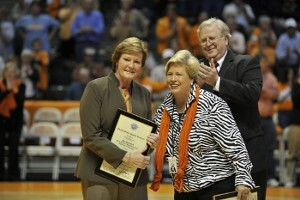 Tennessee head basketball coach Pat Summitt (left) receives the Academy’s 2011 Mildred “Babe” Didrickson Zaharias Courage Award, while Joan Cronan (center), who was the interim vice chancellor and athletic director for both men’s and women’s sports, receives the 2011 Carl Maddox Sports Management Award. Presenting the awards during the season-opening game for the Lady Vols was Academy Trustee emeritus Gene Policinski (right). More than 12,000 fans were on hand Sunday, Nov. 13, at the season-opening game for the University of Tennessee Lady Vols women’s basketball team to see the pre-game presentation of two United States Sports Academy Awards to sports legends in athletics. Head women’s basketball coach Pat Summitt received the Babe Didrickson Zaharias Courage Award, while Joan Cronan, interim vice chancellor and athletic director for both men’s and women’s athletics, received the 2011 Carl Maddox Sports Management Award. Academy trustee emeritus Gene Policinski, former Managing Editor/Sports of USA Today, presented the awards on-court to Summitt and Cronan. Summitt discovered she had early-onset dementia (Alzheimer’s type) but has vowed to fight the incurable disease, raise awareness and keep on coaching. For her indomitable spirit, Summitt earned the Courage Award. Cronan is the first woman in Southeastern Conference history to oversee an entire athletics department and has a 28-year record of success, which earned her the Sports Management Award. Cronan also was honored a day earlier in ceremonies at the Academy in Daphne. The weekend ended well for both Summitt and Cronan: The Lady Vols defeated Pepperdine, 89-57.